Puddles of Myself: Puddles of My Mad Men: "Tea Leaves"
Hello, my Puddlers, I hope your week and the beginning of April are both treating you very well. As you know, I will be writing weekly "Mad Men" reviews for The Montreal Review during the entire Fifth Season. However, since I started doing these reviews on Puddles of Myself, I figure, hey, why not provide a link to my Montreal Review content through the blog I started. "Tea Leaves" was a shocking Mad Men episode because it introduced us to "Fat" Betty Draper—an internet meme that is sure to live on forever. 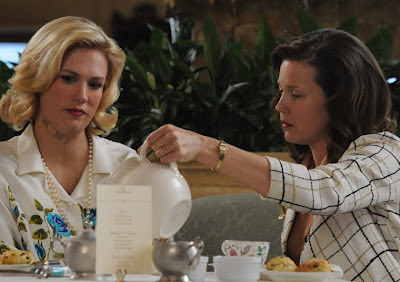 The episode was also one of the funniest episodes in the history of the "Mad Men" series. The in-jokes that the characters and actors can now pull off with subtle facial expressions, hand gestures, and coded speech is truly phenomenal and at times a bit humbling; one would be hard pressed to match the quality of the writing and dialogue anywhere else in TV or in literature. In any event, the episode had humor, mortality and the Stones. What else could you want? Now, read my in depth review over at the Montreal Review.